A Soundtrack can be added to the Home page slideshow as well as to gallery and collection slideshows. The soundtrack will play as the images in the slideshow are displayed. Choose music from 50 royalty free soundtracks. Upload your own music for use as a soundtrack. 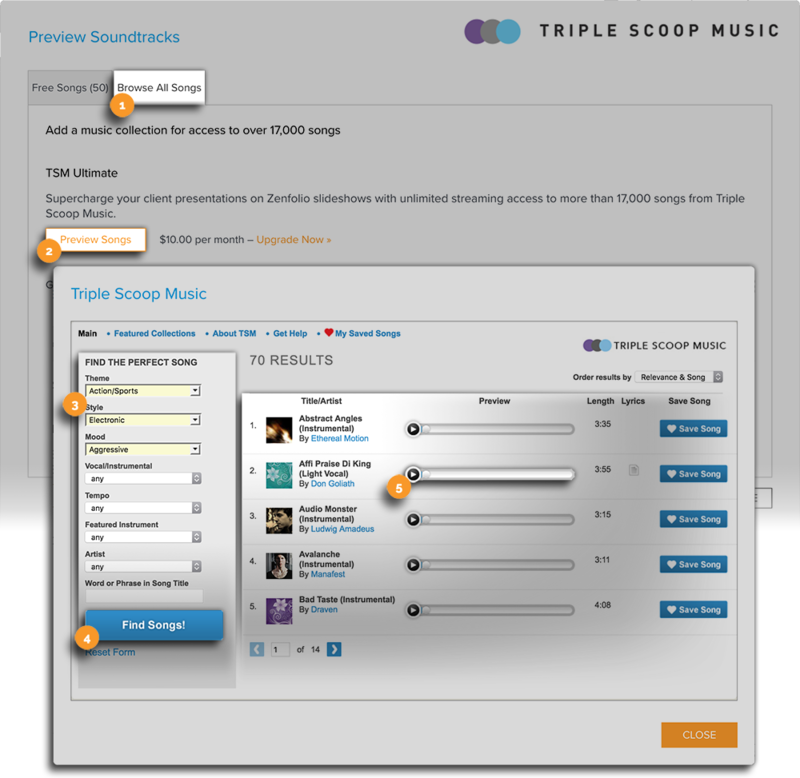 Purchase the Triple Scoop Music (TSM) Ultimate add-on to access 17,000 soundtracks. To help you decide which Soundtrack you prefer you can preview available tracks before using them or purchasing a music collection. Click on Browse and select 50 free songs in your account. A pop-up window will load. From the Free (50) you can click the triangle Play button next to the track you are interested in previewing. When finished previewing Soundtracks, click Close. Click on Browse All Songs. Use the menus on the left to filter music selection by Theme, Style, Mood, etc. Click Find Songs to apply the filters. Click the Play button to preview the song. 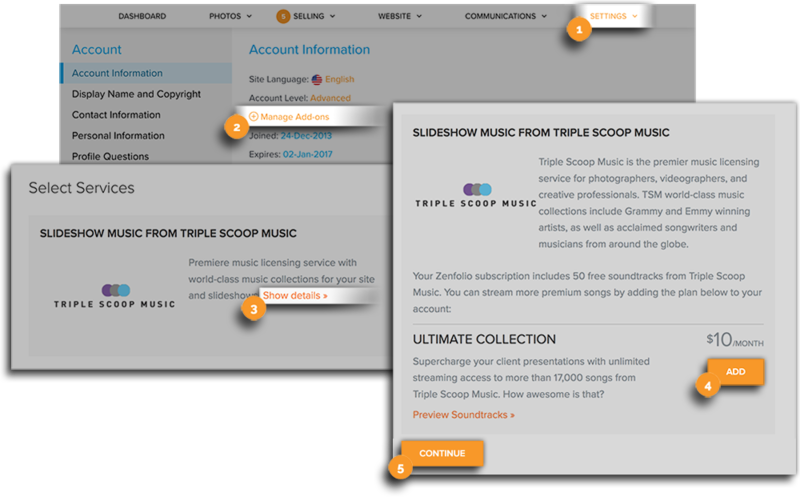 The Triple Scoop Music (TSM) Ultimate is available for purchase as an additional monthly add-on. It provides access to 17,000 soundtracks that can be played in slideshows. For Add-on pricing details, go to this link. In the Dashboard, go to Settings. Click on Manage Add-ons. You can also use this link to go to this page. Next to Triple Scoop Music, click on Show Details >>. Click Continue on the bottom of the page. On the next page, review the credit card payment then click Upgrade Account to complete the new add-on subscription. When your subscription ends, the system will automatically renew the add-on at the TSM Ultimate level. Unlike the TSM 100 and TSM 10K add-ons, the TSM Ultimate is charged monthly and costs $10 per month. 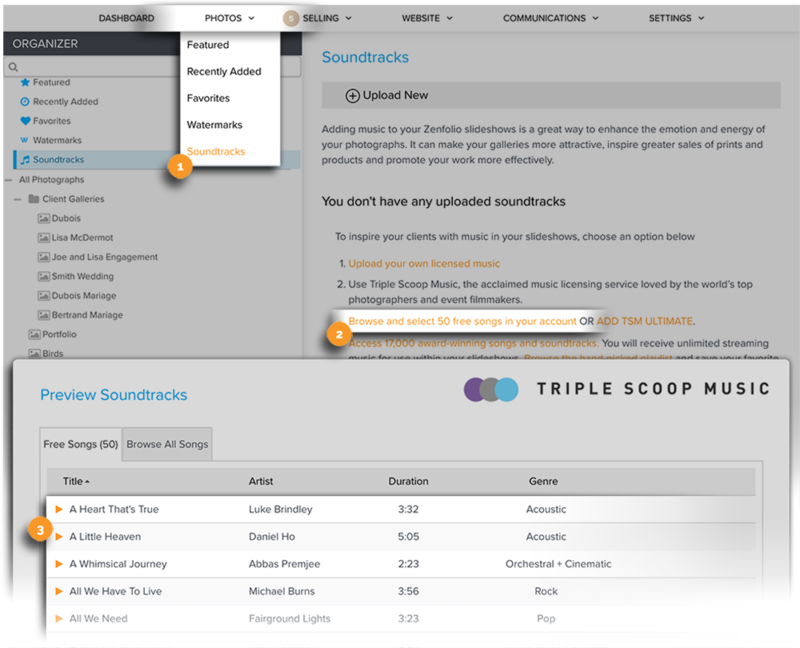 You can also choose to access the 17,000 songs now by upgrading your add-on to the TSM Ultimate level before the end of your add-on subscription. Just follow the steps listed above to proceed with the add-on upgrade. The new add-on will start on the day of the upgrade and the $10 charge for the monthly plan will be charged immediately. You can upload music files in MP3 or M4A formats without protection or DRM/digital rights management. For example, an iTunes purchase has digital rights management applied and cannot be used. Whenever possible, we recommend uploading the music files in the MP3 format. This allows the soundtrack to be played using HTML5, allowing for compatibility with most major modern browser without the need for any additional plugins. When uploading music in the M4A format, the music can only be played using Adobe Flash. This will mean that those viewing the slideshow with the soundtrack will be required to have the Adobe Flash plugin installed in order to play the soundtrack. The maximum file size per music file is 64 MB. 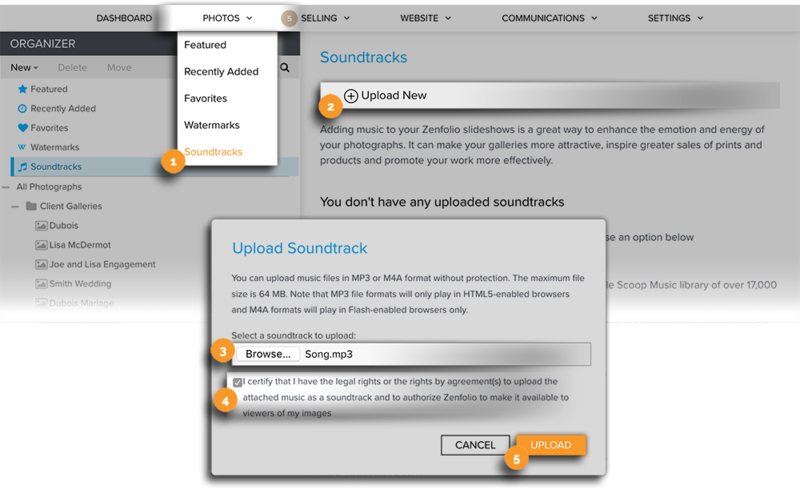 Make sure that you have the license to use the music in your site before uploading to Zenfolio. In the Dashboard, hover the mouse pointer over Photos then click on Soundtracks. In the Main Area click the link that reads Upload New. A pop-up window will load. Click Browse or Choose File (this varies by browser). A pop-up window will load. Select the desired audio file from your computer. Check the box that reads "I certify that I have the legal rights or the rights by agreement(s) to upload the attached music as a soundtrack and to authorize Zenfolio to make it available to viewers of my images." Note: For Full screen homepage layouts the customize toolbar will show BACKGROUND CONTENT and for Widescreen and Classic homepage layouts it will show SPOTLIGHT CONTENT. 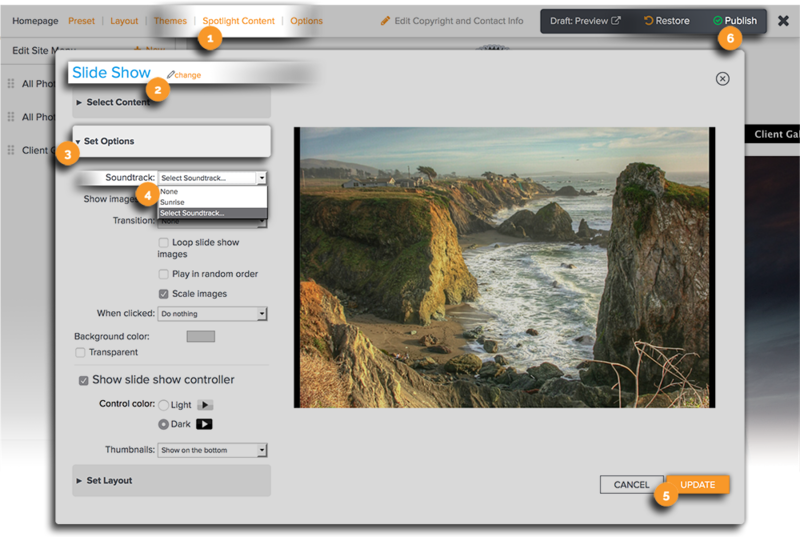 Click on BACKGROUND CONTENT or SPOTLIGHT CONTENT in the customization toolbar. A popup window will open. 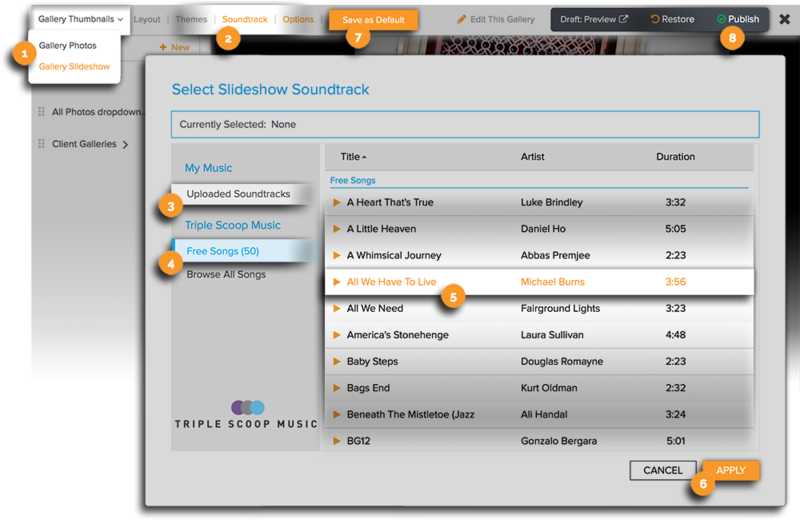 Soundtracks can only be played in Slideshows so if a Slideshow is not already selected, click change then select the Slideshow. Go to the Set Options tab to find the Soundtrack dropdown menu. From the Soundtrack dropdown menu, choose Select Soundtrack. The list of available soundtracks will be displayed. Select the desired soundtrack from the list displayed. When you are done customizing your Website View, click the Publish to apply the change to your actual live site. Navigate to the desired Gallery under the Organizer. Hover the mouse pointer over Preview then click on Customize. The page will refresh with customization tools displayed in a menu across the top of the page confirming that you are now in customization mode. In the top left corner, click on Gallery Thumbnails. From the menu that appears, click on Gallery Slideshow to switch to the gallery slideshow editing view. Click on Soundtrack. This will display the Select Slideshow Soundtrack panel. Click on Free Songs to choose from the list of free songs included with the account. Preview the songs by clicking on the Play button to the left of the song. Click on the desired song to select it.